Clint Eastwood made a fine directorial debut with this very effective thriller that’s a precursor of Fatal Attraction, which ripped off whole scenes from it. This is by far the better film. Clint is Dave Garver, a popular DJ for an all-night jazz radio station. A woman (Jessica Walter) calls every night to request “Misty.” Soon she introduces herself as Evelyn, and Dave, playing the field in the wake of an uncertain relationship, goes to bed with her after she assures him there’ll be no strings attached. Dave’s former lover Tobie (Donna Mills) comes back to town, and he would like to rekindle the romance, but Evelyn gets in the way — she becomes possessive, first in small ways, then in frightening, destructive ways. Evelyn, it turns out, is not only exceptionally needy and insecure, she’s also a psychopath. A laid-back guy like Dave would naturally resist commitment, and Evelyn holds him to everything he says, reading messages of love where there are none, going more and more overboard, until finally Dave comes home one afternoon to find his furniture trashed and his cleaning lady slashed. And that’s not the end. 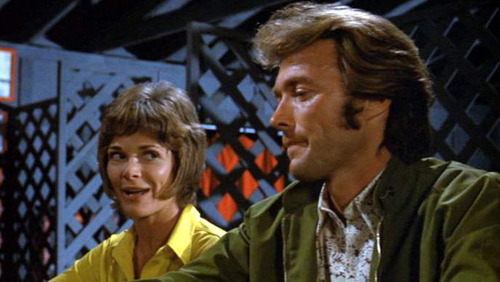 Clint’s direction is sometimes shaky but usually assured, and he gets a bold performance from Jessica Walter, who manages to be most scary when she’s least threatening (although it’s weird to go back and catch her in this after watching her on Arrested Development). Evelyn isn’t given a past, so there’s no psychobabble explaining why she’s berserk; Walter’s mannerisms and general aura of desperation tell us all we need to know.